00:27:00 Makes 4 servings, 1/4 recipe (314 g) each. 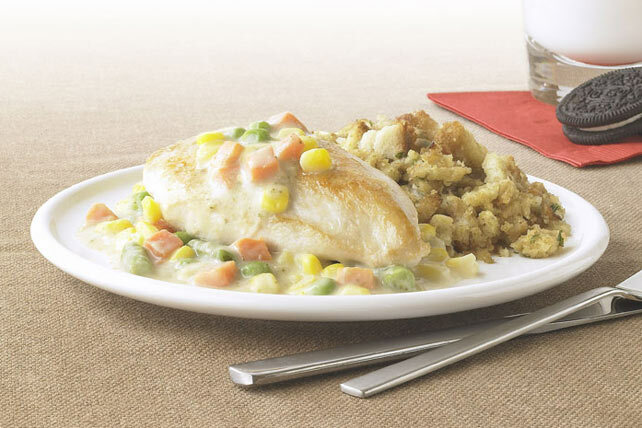 Chicken and veggies in a creamy sauce with a side of stuffing - comfort food at its best, in record time. Prepare stuffing mix as directed on package. Heat large nonstick skillet on medium-high heat. Add chicken; cover. Cook 5 to 7 min. on each side or until chicken is cooked through (170ºF). Remove chicken from skillet; keep warm. Add vegetables, water and soup to skillet; cover. Cook 6 min. or until heated through, stirring often. Return chicken to skillet. Cook and stir 1 min. or until chicken is coated and heated through. Serve with stuffing. Use any frozen vegetables you have on hand in place of the mixed vegetables, such as broccoli, green beans or carrots. This flavourful chicken recipe is sure to be a family pleaser. The mixed vegetables provide an excellent source of vitamin A.